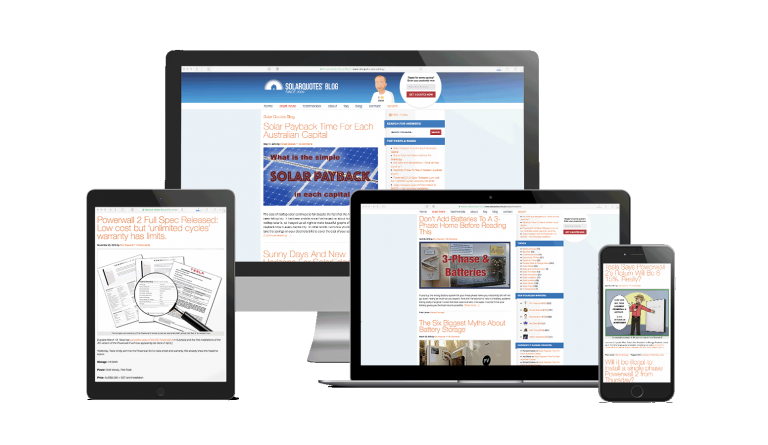 I’ve been blogging about solar energy since 2009 on the SolarQuotes® blog. I cover solar installations, regulation, politics, hardware and anything else you can think of solar-related, with a few rants thrown in for good measure. Also on the blog you’ll also find articles by Ronald Brakels, the strangest but most objective technical blogger I’ve ever met (and certainly the only one with a horse called Tonto23 ). Ronald’s posts are both informative and quite entertaining – there’s no other writer quite like him covering the solar industry. You’ll also find the ever-dependable Michael Bloch who keeps everyone up to date with daily solar news from Australia and abroad. Head on over for the best Australian solar news and opinion.